Aliyah tip #8- Are you sure that food is organic? Making the commitment to eat only organic food is not something easily done when you have a tight budget. Unfortunately, healthier food seems to always be more expensive than processed junk food, and organic produce is no exception. Israel is a major exporter of organic produce to the EU- 13% of our exported produce is organic, which translated to 85,504 tons of vegetables, 2192 tons of fruits, and 2230 tons of citrus in 2013. It might surprise you to learn that until 2008 there was no legislation governing organic produce- for example what conditions it can be grown under, what products can be used on organic fruits and vegetables and what symbols are acceptable to identify organic produce. Since the new law was passed in 2005 (it did not come into effect until 2008) these issues have all been addressed as well as a penalty for falsely labeling a product as organic when it is not. The law has been written in English and Hebrew so feel free to follow the link and read for yourself. In addition, each certified organic product must have the symbol of the certifying agency that inspected the operator. There are three approved agencies and their symbols are shown below. In order to ensure that these foods are truly produced without unapproved chemicals such as pesticides, the Ministry of Agriculture samples fresh fruits and vegetables as well as processed foods such as bread and rice cakes and submits them for laboratory analysis. The results of those tests have recently been published and it is good news for organic consumers. When products were first tested in 2009, 24% showed the presence of unapproved chemicals. In 2010 the percentage dropped to 8.6%; 2011 went down further to 3.6%, 2012 went back up to 6.8% and 2013 again showed a downturn to 3.8%. Since Israel exports organic produce to the EU, it is subject to periodic auditing from the Food and Veterinary Office of the European Commission. In 2013 they performed an audit on the production of organic produce in Israel. The full report can be found on their web site along with the Israeli government’s response. Overall they were satisfied with the Israeli legislation (which is based on the European legislation) and its implementation. They felt that Israel’s sampling technique and the amounts sampled should be improved as well as the quality of inspections performed at the producer level. They did find the presence of certain illegal pesticides which the Israeli government agreed to enforce more strongly. One comment I did find disturbing was that the Europeans were dissatisfied that “foreign” produce was intermingling with Israeli produce and being labeled as Israeli produce. What is this “foreign” produce? Produce that comes from the West Bank- Yehuda and Shomron. What was Israel’s response? That this matter is an issue for the Israeli Ministry of Agriculture and the European Commission to decide. Once it is agreed upon at that level, it will be implemented on the “ground level”. It is appropriate that Aliyah tip #7 is about shmita – the seventh year in the agricultural cycle. For those of you who don’t know, during the shmita year we are required to allow the land a chance to rest. As you could imagine, this leads to many questions and the potential for considerable division among the different segments of religious and non-religious Jews. The division rivals that of Pesach- kitniyot, gebrakht, mustard, garlic, etc. becomes heter mechira, otzar beit din, yevu m’chul, and more. For new olim the different groups (I hate to use the word “factions”) can be quite confusing. Over the summer I will be going through the history of shmita, the different terminology used, and many differing opinions in subsequent posts to help each of you make an informed decision as to what opinion you will hold by. My main concern, however, is that we use this shmita year not as a way to grow further apart from each other and our land, but to help us become even closer. This Thursday, 17 July 2014 will be a large one-day conference on shmita at Kibbutz Gan Shmuel. Admission is free and there will be shuttle service from the Binyamina train station from 8am-10am that day. If you sign up in advance, there will also be a shuttle from the Arlozorov train station in Tel Aviv. The conference is in Hebrew. For more information, go to their web site or their Facebook page. Click on the schedule to see a full-sized copy. It’s hard enough getting around in a foreign language when you are healthy, especially a giant bureaucracy like the Israeli health care system. Can you imagine doing it when you have a major illness? It is most definitely an obstacle that needs to be conquered. When we came to Israel, I falsely assumed that since healthcare is science and English is the universal language of science that everything would be easily accessible in English as well as in Hebrew. What a mistake! I know we lost out on several rights because we didn’t understand the system then and it has followed us to today- we never knew we had to “transfer” our youngest to a new Tipat Chalav when we moved so we were told we had to get the polio vaccine in our old neighborhood- a two hour drive away! Fortunately I have become a lot more aggressive since then and knew the right people to call and make things happen. Most people, especially immigrants, don’t have those connections and subsequently do not fully utilize the services available to them. There have been several articles documenting this phenomenon in different areas of Israeli healthcare- hospitals, Pap smears, vaccination and more. Even the OECD remarked a disparity in the quality of care for immigrants (among other populations) as compared to native Israelis. However, most of the studies and the subsequent attention paid to remedy this disparity has focused on the Ethiopian and the former Soviet Union populations, which are more numerous than the Anglo population. However, in 2011 the Director-General of the Ministry of Health wrote a directive (in English) requiring English accessibility from healthcare providers, starting February 2013. Has anyone noticed a change yet? Fortunately, there is the Shira Pransky Project. This web site has an impressive assortment of information to help navigate the healthcare system in Israel- from Bituach Leumi to rights of the mentally ill to speech therapy to long term care insurance. They also have a Facebook page. I highly recommend that everyone bookmark this page – hopefully you won’t need it! Most of us at one point or another drink milk. In Israel we marvel about milk in bags, and those of us who read the labels know that the great majority of milk is not fortified with Vitamin D. We know all Israeli milk is “chalav yisrael” and we also know that there is regular and mehadrin milk. One of the strangest statements I heard when I was younger was “we don’t drink milk on Sunday.” What?? Is milk somehow not kosher on Sundays? Some time later I moved to a religious kibbutz and worked in the refet (dairy). One day they tell me with pride that they are one of the few kibbutzim who are allowed to ship their milk on Sunday to Tnuva Jerusalem, the all-mehadrin dairy. Again with the Sunday! Now, however, I can find out what it really means directly from the source. Milk in Israel generally comes from kibbutzim/moshavim which are owned by Jews (It used to be that only Jews milked the cows, but times have changed and there are many foreign workers who are not Jewish). These refetot are caught between the dilemna of working on Shabbat by using electronic milking machines (or even by the actual act of milking) and that of tzaar baalei chaim- the mandate to relieve the suffering of animals, even on Shabbat. So how does a Jewish farm solve this dilemna? Considering the fact that we are Jews, there are many different opinions as to what to do. The obvious but most strict is to milk the cows but throw out the milk so as not to obtain pleasure or financial gain from the milk. There would therefore be no milk on Sunday in that scenario. Since we drink milk on Sunday, that is obviously not the prevalent solution. In order to prevent great financial loss, the refetot spill or “contaminate” only a certain percentage of the milk and they store the rest. Refetot are required to have a refrigerated tank that can hold 48 hours worth of milk so it doesn’t have to be transported on Shabbat. The greatest innovation regarding milking on Shabbat is the milk transporting system. With the exception of very small farms, in all milking parlors the machines to transport milk are run electronically. Additionally there are computers that read the cow’s leg tag, compute her milk production, and can give warnings if there might be an infection in the teat. There are even robotic milking sheds that employ no humans at all. All of this technology is shut off on Shabbat and the milk is transported by pneumatic or vacuum systems. Back to one of my original questions- what is the difference between regular milk and mehadrin milk? It isn’t that the cow only eats mehadrin foods. According to Tnuva, their mehadrin dairy products are only made with milk that was milked on a weekday or was halachically milked on Shabbat. Now that we have solved those problems, we are faced with an even bigger dilemna starting in a few weeks. Rosh Hashanah this year is on Thursday/Friday and immediately after that will be Shabbat. As mentioned before, dairies are required to have at a minimum 48 hours cold storage of the milk, but now we have to deal with 72 hours! 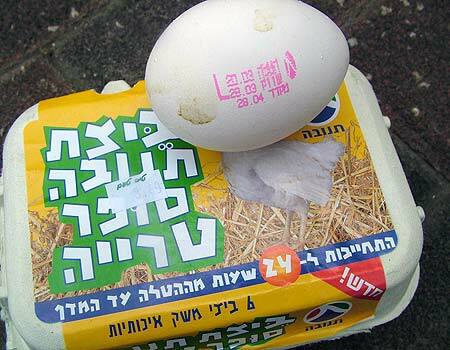 Fortunately, the Israeli Milk Board and the Chief Rabbinate of Israel have come up with solutions and helpful advice. The IMB is allowing storage of milk in “thermos” tanks for up to 24 hours, and recommends that every farmer deliver their milk right before the start of the holiday to have an empty tank. 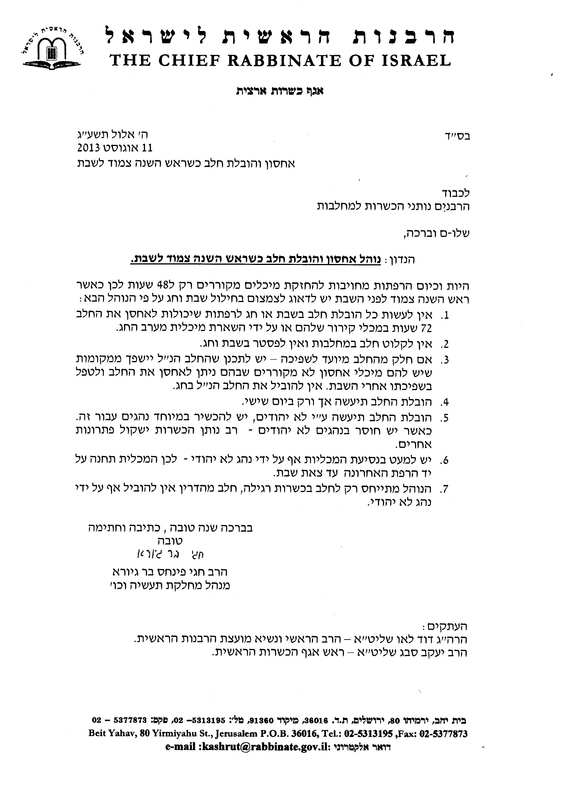 The Rabbinate will allow transport of milk by non-Jews on Friday only if and only if the dairy does not have sufficient storage for the entire holiday. That milk will be used for regular and not mehadrin milk. Of course that leads me to ask who is working in the factory to accept the milk on Friday? I am guessing there is a staff of non-Jews. So there you have it. For those of you who eat/drink mehadrin, I hope you have a better understanding of why you chose to drink mehadrin milk. For those of you who do not, I think it is fascinating to see how Israel can be one of the most technologically advanced countries in the world but at the same time be firmly grounded to tradition. A religious Jew in chu”l takes advantage of so many businesses and services on Shabbat because they are run by non-Jews- electricity, security and food being some. With the creation of a Jewish State everything has to be re-thought, which is a good, even a great thing for Judiasm. The chance for a religion to grow and develop with the modernization of the world can only come about when presented with challenges such as these in our relatively new Jewish State. Next aliyah tip- why you can’t (or shouldn’t) buy fresh chicken on Sunday…and it has nothing to do with kashrut! One of the things I dread most about back-to-school shopping is the “school-shirt-pushing-and-shoving-extravaganza.” I dont know why this event brings out the worst in people, but I do know how important it is when, after being polite Anglo me, I waited for over an hour one night until there were no shirts left for my daughter- color or size. My solution in past years has been to trick my husband to get the shirts- “Honey, could you pick a pizza for dinner? Thanks. While you are there, could bring a couple of kids and have them pick out shirts while you wait for the pie?” My husband, however, is on to me and won’t go near the store even if I bribe him with a steak dinner. This year I am going to do it differently. In the past I have gotten flyers in the mail about Tilboshet– the online store to buy school shirts but never gave it much thought. I am the type to examine, try on and hover over the person who irons on the symbol to make sure all is to my satisfaction, and online shopping doesn’t fulfill those needs. However I just read a review from a fellow blogger Matanot v’Metziot baReshet who was very pleased with his/her purchase and that convinced me to give it a try. There are great pictures on the blog post to get an idea of how the packages look. One out of two of my children’s symbols are posted on their web site. However, you can photograph and send them your school symbol should it not be there. Shirts are 100% cotton and 160 grams/meter [not sure what that means- I think it is a tight weave]. You can return the shirts and they will credit your credit card. There are detailed measurements to decide what size you need. There are 3/4 sleeve shirts for those who need, including light and dark pink. Prices for short sleeve shirts in sizes 6-18- 5 for 99 shekels (including shipping), 12 for 209 shekels (including courier service to your house) and more deals on the web site. Deals for using PayPal as well (free shipping). There is an additional charge for S,M,L,XL and 3/4 sleeves (couldn’t find how much). The orders can be picked up at no charge in Givat Shmuel (6 shirts size 6-18 for 99 shekels), sent by doar rishum for 15 shekels, or couriered to your house for 29 shekels. You can also order on the phone. You have to wander around the web site a bit to find the coupon codes. If people request, I will list them. So what do you have to lose? Give it a try. Aliyah tip- For those of you who never purchased school shirts before, don’t be lured in by the super cheap deals you see for 5-15 shekels per shirt. Two washes and the sleeves fall off with the symbol. Don’t bother. In conjunction with my pizza dough recipe contest, I wanted to point out the difference between pizza cheese and real cheese. What is it about pizza that makes these companies think that we don’t want to use real cheese??? Notice the last two actually say “cheese”. As I am sure you have seen, Israel beef cuts do not have the same names as they do in our native lands- in fact, they even have numbers. Many great bloggers have already deciphered them for us- Baroness Tapuzina, Ruth Baks on IsraelFood, and IsraelEasy so I won’t reinvent the wheel. Katherine Martinelli even has a fun post on the trials and tribulations of making brisket for Thanksgiving. For a barbecue we have decided that that there is no better steak in Israel than sinta (#11)- much better than entrecote (#1). Just realize that numbers 11-18 are from the hind of the cow- Sephardim kept the tradition of nikkur but Ashkenazim did not so their tradition is not to eat the hind end. This, like the tradition of not eating kitniyiot on Pesach and saying only “taf” instead of “saf”, are some of the traditions that are slowly fading (some more slowly than others). What I really wanted to talk about was the difference between frozen and fresh meat, and the different types of fresh meat. As you could imagine, me’ubad beef should be cheaper than 100% beef. Meat that is imported to Israel frozen is “wet aged”- placed in a vacuum pack for at least two weeks to allow the meat to become softer. In theory it should garner a higher price. Personally I have not seen a quality difference. More about aged beef to come. 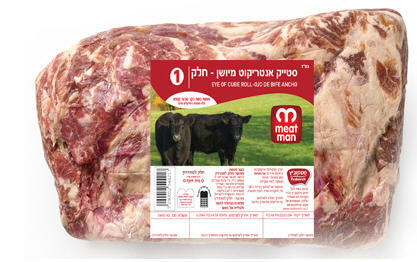 Because of import taxes, fresh beef is not imported into Israel- only frozen. There have been some trials but to date it is unsuccessful. Most cattle that are used for beef in Israel are imported from Australia at a young age and then raised here for approximately 6 months. To summarize, make sure you understand what you are purchasing, and make sure the price you pay isn’t too good to be true.